The purpose of this study was to determine the influence of pedalling rate on cycling efficiency in road cyclists. Seven competitive road cyclists participated in the study. Four separate experimental sessions were used to determine oxygen uptake (V˙O2) and carbon dioxide output (V˙CO2) at six exercise intensities that elicited a V˙O2 equivalent to 54, 63, 73, 80, 87 and 93% of maximum V˙O2 (V˙O2max). Exercise intensities were administered in random order, separated by rest periods of 3–5 min; four pedalling frequencies (60, 80, 100 and 120 rpm) were randomly tested per intensity. The oxygen cost of cycling was always lower when the exercise was performed at 60 rpm. At each exercise intensity, V˙O2 showed a parabolic dependence on pedalling rate (r = 0.99–1, all P < 0.01) with a curvature that flattened as intensity increased. Likewise, the relationship between power output and gross efficiency (GE) was also best fitted to a parabola (r = 0.94–1, all P < 0.05). Regardless of pedalling rate, GE improved with increasing exercise intensity (P < 0.001). Conversely, GE worsened with pedalling rate (P < 0.001). Interestingly, the effect of pedalling cadence on GE decreased as a linear function of power output (r = 0.98, n = 6, P < 0.001). Similar delta efficiency (DE) values were obtained regardless of pedalling rate [21.5 (0.8), 22.3 (1.2), 22.6 (0.6) and 23.9 (1.0)%, for the 60, 80, 100 and 120 rpm, mean (SEM) respectively]. However, in contrast to GE, DE increased as a linear function of pedalling rate (r = 0.98, P < 0.05). 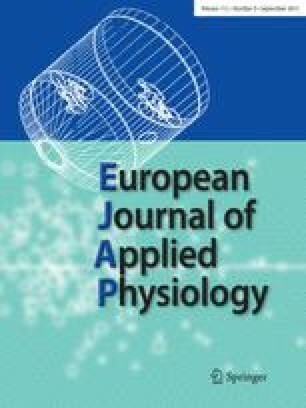 The rate at which pulmonary ventilation increased was accentuated for the highest pedalling rate (P < 0.05), even after accounting for differences in exercise intensity and V˙O2 (P < 0.05). Pedalling rate per se did not have any influence on heart rate which, in turn, increased linearly with V˙O2. These results may help us to understand why competitive cyclists often pedal at cadences of 90–105 rpm to sustain a high power output during prolonged exercise.